Please don’t think I’m a fan of chaos, bad tidings or lower wealth. Far from it. 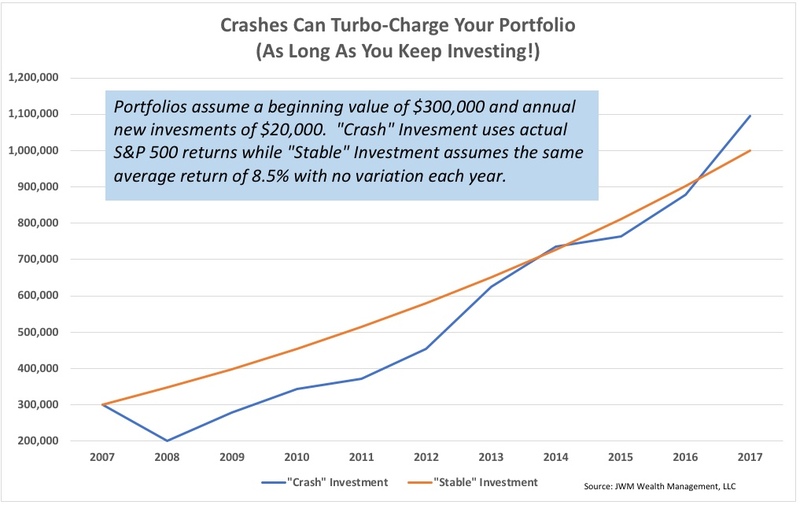 But a crash may be good for you – even if you are fully invested. There are two factors that work in your favor here. First, markets are subject to “mean-reversion.” This $2 word describes the market’s tendency to self-correct and maintain a fairly constant annualized return over the long-run. So, if the market averages, say, 7% per year but drops by 20% this year, then we can reasonably assume it will grow by an “extra” 27% (on the original base) in coming years in order to maintain that 7% average. Of course, this is all dependent on whether the future will be similar to the past. But considering that past crises have not derailed the markets from this path, it’s hard to understand why the future would be any different. This is why the four most dangerous words in investing are “this time, it’s different!” Because it never has been. Let’s take a quick look at the 2008-2009 crash (the worst since the Great Depression). The average return from January 2008 through 2017 for the S&P 500 (reinvesting dividends) was 8.5% (including the crash, of course). An investor who started with 300k and socked away $20k at the beginning of each year would have made $595,000. An investor in another time where the market rose exactly 8.5% each year would have only earned $500,000, even though they also invested the same $20k at the beginning of each year. You see, it’s the sequence of returns that matters here. While we are putting money to work, we want lower prices, as long as the market is determined to mean-revert! Of course, this doesn’t work so well for retirees who are drawing from their investment. When we get to that point, however, we use our Financial Plan to support us during market crashes so that we can reduce or eliminate withdrawals during downturns. This allows us to stay invested during the market downturns, mitigating their actual effect on our portfolio. To do this, we need that plan in place years prior to entering retirement. But once it’s there, we’ve greatly reduced our worries about the markets! Got a question? Use the form below to "Ask Me Anything" and I will respond to you personally!